Today's customers expect flawless interactions with a company's websites. Whether visiting a site for information, entertainment or to make a major purchase, users are sensitive to even the slightest missteps in web design. Even for small companies, putting their best foot forward online is a crucial step to attracting and retaining customers. Huemor Designs is a full-service web design and SEO firm that can help your business establish a world-class web presence. Through almost a decade of experience, it has learned what things work and what don't. This enables you to get your business' web presence right the first time, avoiding the risk of losing potential clients due to an unprofessional web presence. 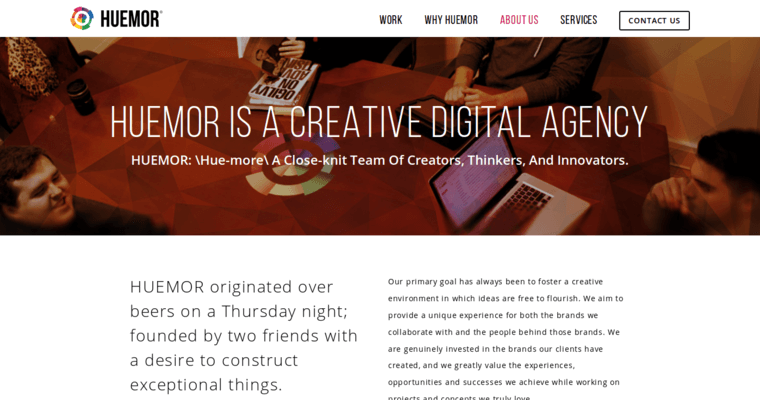 Huemor Designs has successfully completed hundreds of websites and marketing campaigns. Their vast experience can be put to work to give your business a world-class web presence. Huemor Designs can help you make a lasting first impression on your business' web-based clients.